Okay, let’s be real for a second. How often are you getting active with your kids? 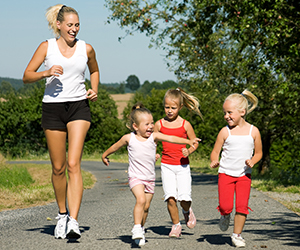 The number of parents who do not regularly exercise with their children is staggeringly high. At California Family Fitness we want to nurture “family activity time”. So here are 10 (fun) ways to get-up-and-go with your kids this week! Do burpees together. We know! Burpees are nobody’s best friend. However doing them alongside your kids makes these uber calorie burning exercises, dare we say it...enjoyable! Build a fort. And then play in it! It’s easy to help your little ones build a fort and then leave them to the fun. But take half an hour to actually get on the floor and play with them. Make it a fun swashbuckling pirates adventure, or take a safari through Africa. Have a relay race at the park. Pair up your family members and have everyone take turns running, hopping, skipping or lunging to a nearby tree or bench and back again. Rake your yard. Jump in it, then rake it again! This is a favorite pastime for many and it’s easy to forget to let your kids experience the simple joy of a pile of leaves. Yes, you do have to rake twice, but it’s well worth it. Dust off those bikes, roller blades and razor scooters for a family jaunt around your neighborhood. Sometimes the heat of the summer drives us inside, but now that it’s getting a little cooler it’s the perfect opportunity to head back outdoors. Fall is the perfect time to take a trip to a pumpkin patch or head to your favorite orchard. Many have pick-your-own apples and pumpkins, not to mention hayrides, corn mazes, petting zoos and so much more fun for everyone. If you love heading to the gym as a family, try staying together for your next workout instead of spreading out into your designated corners. You could swim together in the pool, head to the basketball courts, or volley a ball at the indoor courts. Take a nature hike and tap into your kids’ inner Explorer by bringing a small basket or bucket for them to collect some nature specimen. Consider putting all their items in a memory box to keep them safely displayed. Have a good old fashion hula hoop showdown together. Everyone will love shakin’ it to their favorite song and you’ll sneak in some calorie burning cardio as well! Head out to your local farmers market to load up on some fresh produce. The kids will love picking their own fruits and veggies. Take it a step further and have your little chefs help you prep the produce they picked for dinner! Don’t stop once you’ve reached #10! Keep looking for ways to be active together as a family and remember that kids love to imitate their parents. So make sure your fitness behaviors are ones you want them to repeat!